One late July morning I leave my loft in Greenwich Village, taxi to Grand Central and take the Metro North up to Yonkers. I walk up the hill past the Greyston Bakery and the Greyston Daycare Center and two Greyston apartment buildings which house the formerly homeless to the modest single family dwelling that is home to Greyston's "Zen Peacemaker Order". I say hello to the friends with whom I've been studying for 3 weeks, and then head right back downtown on foot: down Broadway through the Bronx and upper Manhattan to the Cathedral of St John the Divine at 112th street. It was a gentle 10 mile walk with small groupings of the 22 people who participated We were led by Bernard Tetsugen Glassman Roshi, a Zen Buddhist priest, who lately has said that he prefers to simply be called Bernie. I had debated whether to take my camera, after all one of the ideas is to let all your normal attachments drop away, but Bernie says that the camera and me are one which I take as an excuse to compromise. My resolution to leave the camera in my bag lasts about 20 minutes after which it rarely gets packed away again. In South Yonkers I encounter a tough mobster type who is aggressively questioning why I am photographing his shop; I am giving him my usual explanation about being a crazy artist when he and Bernie recognize each other as baking colleagues; he insists we take along several large bags of his special pitas which serve to keep our hunger at bay for the rest of that day. We start collecting cans - our first lesson is that many of them are only redeemable in Maine, and our second is that very few stores will accept them from us even though they are required to by law. Finally, we find a large supermarket which has redemption machines, but they are broken. Using our ruling class skills, we have the bottle manager paged and get the machines fixed only to find that very few of our bottles are accepted - I managed 10 cents for my efforts while others got as much as 75 cents for an hour's work. Bottle money is hard earned. Later in the day we found that begging was much more efficient: one person got a buck and a half and another 4 bucks in an hour outside the Cathedral. What we didn't use from our begging we passed on to other beggars when we left the street. 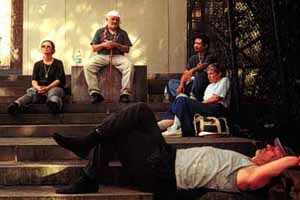 We arrive in small groups at the Cathedral and lie down on the steps to rest. At 8 pm a Ryder truck pulls up and a crowd of homeless gather like seagulls around a fishing boat. .
We inquire of a panhandling woman about places to sleep in the neighborhood; she tells us there is a place at 108th and Riverside Park where the police have been leaving people alone and which is not too dangerous. On the way over we make note of a scaffolding on Broadway as a place to take refuge if the skies open during the night. It's not clear exactly where to bed down, but we settle for what I later realize was a dog run next to several tables of all-night chess players who were very knowledgeable about Zen practice. We send a patrol back to Broadway to scrounge some cardboard for mattresses to keep the damp ground at bay. I even wrapped a small box around my chest - it was July and we were cold, but this was to be the warmest evening of our time on the streets. My head roosted between my camera and a large root, my boots tied securely to my arm, I lay awake for a long while staring up at the majestic maple branches and watching the puzzled dog-walkers wonder. I managed sleep by about 1 AM, the hurricane rains came at 3 AM and didn't stop for 30 hours. We break camp and head south; we were asked to bring no money or toothbrush, but we were prepared with rain ponchos which kept half our bodies dry. One of us comes up with a lame knee and Bernie lends his cane. In the wet darkness at 62nd street and Broadway, across from new Trump luxury housing we find an office building that offers an overhang and a warm pavement. Soon there are 8 sleeping bodies gratefully stretched out while I talk with the two wholesale bottle dealers who are waiting under the same overhang for the buyer's truck. Tony works the bottle beat so he can enroll in computer animation course. He is a dignified intelligent man who works very hard and is proud that he earns an honest living without stealing. He collects many of his own bottles, but is also buying wholesaling from other collectors; he pays them 2.5 cents and sells for 5. He agrees with my theory that bottle people don't get the respect they deserve as hardworking, capital-poor entrepreneurs, would-be American heroes! The sky starts turn from black to blue and we walk in the continuing rain to 31st street between 7th and 8th where we attend the 6 o'clock and 6:30 masses at St Francis Church. We are glad to be out of the rain. 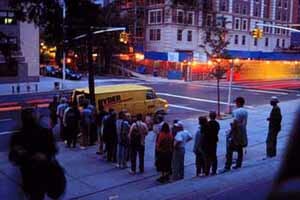 At 7 we join the end of a long line that runs down the entire block - the line moves quickly and we are given a double sandwich - one slice of baloney & cheese on white bread, and offered coffee. I don't take the coffee because I don't want to need too many bathrooms. I have begun to see MacDonalds and its public bathrooms in a whole new light. 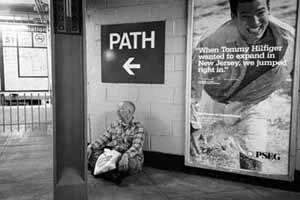 The rain comes down heavy, the wind blows hard, and we take refuge in the PATH train subway entrance on 30th and 6th. Sitting down along the walls so the train riders have free passage, we do our morning Buddhist service chanting the "Jewel of Sweet Nectar" and our closing song, "This is our life, the length of our days, day and night we meditate together". The early arrivals from New Jersey don't quite know what to think of us. I venture out to seek a weather forecast. I find myself trying to pick out middle class English speakers who I can imagine tuned in their tv or radio before they left for work. This eliminates about 95% of the people arriving for work here in the fashion district. Most of those I asked ignored me as if they would be somehow diminished by responding, others just said 'rain', one said it was to end the next morning, another said rain for 2 days, another promised rain for 3 days. I laughed as I realized that here was the son of a famous meteorologist begging on the streets of New York City for what was the most common thing in his childhood household, a weather forecast. My 'water-proof' boots are now soaked and squished with every step. By this time I am starting to get teased about being hyperactive, Bernie asks if I am not comfortable just being still. I join the group and lie down on the subway floor opposite the turnstiles. That feels great and soon I drift into dreaming. 15 seconds or 15 minutes later my floormate taps me to warn me about the giant puddle advancing on my bed. It's now 9 o'clock and we head back out into the rain toward our next destination, St. Mark's Church on 9th street and 2nd Avenue. We are cold and very wet. 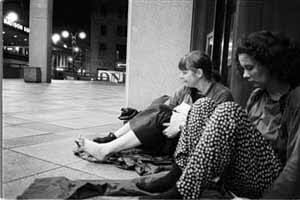 We do a short period of zazen on the cement steps outside the church and then divide by gender with the men heading for the Catholic Workers soup kitchen on 1st street and the women to the Mary House of 3rd street. The soup kitchen is one small room with several tables and chairs. I take a seat at a table for 4 and am immediately brought a large bowl of rich pea and potato soup, a stack of bread, and a cup of cool tea. The soup is delicious. I am soon joined by a thin black woman - the only woman in the room - she has braided hair, the manner of a nervous cat, and looks strung out. She slathers her bread with margarine, loudly demands that her tea be hot, refuses to taste the soup, and is clearly enchanted by the man who is serving us. I tell her how good the soup is, but she explains that she is now going to Mary House where the soup is made with love and that she will not eat it here where it is made by men and machines; I tell her again that the soup is real good. She eyes the waiter, I say I have a vision of the two of them walking down the aisle in marriage and I start singing a wedding song; she nearly coughs her bread out in my face. "Marriage, NEVER , NEVER, NEVER, but....but I could see using him for something". I propose we conspire to draw him over to the table, and soon enough he is sitting down with his own bowl of soup, and we are all laughing and teasing one another. Angie is soon eating her soup (albeit with several tablespoons of sugar) and telling me things like, "If people treat me well I will be civilized and charming, if they treat me bad I will bite them". I completely believe her and I feel that this is the best dining conversation I've had in months. The punch line is that when we are saying goodbye she reveals that her secret hiding place is in Washington Square Park at the head of Sullivan Street, and I suddenly realize that I know her from my other life as a bourgeois resident of that block. She is the most outrageous of the homeless/drug dealers that haunt my corner and make local life a little problematical; my wife lets herself be robbed of the pleasure of the park because this crowd is so verbally abusive. I am looking for Angie now every time I leave the house and wonder who I will be when I see her again. The women don't return from lunch, so Michael and I go in search. Soaking wet, we find them all dry and cozy inside the Mary House, having tea and licking envelopes. It seems that after receiving an unfriendly welcome (not truly in need), they were fed and cared for, and proceeded to be generally helpful so nobody wanted them to leave. They left with dry socks and sweatshirts and one pair of rugged hiking boots; the men appreciated the warmth the women brought back. On the steps of St. Mark's Church again we chant Buddhist service, do zazen, and speak in turns around the circle. We share the steps with Paul and his young friend Matthew who is shaved bald like several of us, except for the mohawk lining the middle of his scull. Marzena has brought Matthew a sweater from the women's shelter which he appreciates, and while she sits by his side quietly talking, I snap a photograph. Matthew is angry. Later I apologize and offer destroy the photograph; he does not take my outstretched hand and says it can be very dangerous to do what I did, that someone else might hurt me for doing the same. Paul calms him and says the picture is ok and later Matthew is wondering where I am going to put the picture and telling about having been on the cover of Time. Paul, who is very well groomed, left 3 kids behind and has been on the street for 5 years; they live behind Small Antiques on Bond Street right beside my photo lab. They are very careful to leave the place clean early in the morning, because a hospitable place to sleep in this city in this city has become a very precious commodity. Bernie can't stand up, his back has gone out; we leave him sitting alone on the steps of St. Marks. With the rain still pouring down, we continue without our leader. We walk to Tribeca where we are invited to the Sufi Mosque for a meal, a wild ceremony called Dhikr, and, most important, a dry floor for sleeping. The Sufi prayers and dancing put us in a kind of ecstatic trance, but I am pulled away by the news that one of us is missing. Roland Schmidt, a Catholic priest from Switzerland was last seen seeking warmth in the Astor Place subway station. We realize that he did not have the address of the Mosque nor did he have any money or know the city. Michael and I head back into the rain to search with no success. The next day we found that after looking all over Broadway for us (we were on West Broadway), Roland gave up and really had to beg. 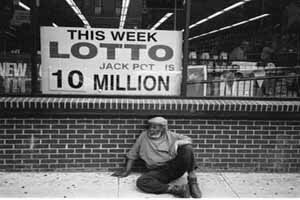 He managed to collect enough for subway fare to Grand Central where he managed to beg again for a ticket to Yonkers. His observation was that the ones who gave to him avoided his eyes as much as the ones who didn't. I was jealous that he had been handed the most genuine experience of all. We slept dry and woke to breaking clouds. We donned our still wet boots and headed for Thomkins Square Park, did our Buddhist service, and sat zazen. Back to the Catholic Worker for soup where I sat at the same table and met another amazing character. Kevin was a handsome lean white man with long hair and wild intelligent eyes. He was writing notes on a folded paper and I thought he was on the staff of the institution, but he later reminded me of David Koresh. I broke the silence by commenting that I had the same system for filing my thoughts and started a conversation that refused to end for 2 hours. Kevin had at least 9 books in his bag (he was currently reading Naked Ape from which he would quote at will); he transfers his thoughts to his computer and has just finished writing 15, 000 pages of his theories (I believe him). He presented one radical, sophisticated, psychological or philosophical idea after another almost all of which I agreed with completely; finally I had found my intellectual soul-mate. Even when he quoted Hitler, which he did regularly, I often agreed with the thrust of the thought, even when he explained the logic behind grabbing a girls hair or surprising them with fright (the peek-a-boo theory of enlightenment), I agreed with the theory. He complained that women didn't seem to respond to him the way he would like, they seemed to run away. I counseled him to try to go slower, to listen and leave some room for them to breath, and to consider whether he had the unilateral right to apply his theories to the women without their consultation as did Hitler. He agreed that Hitler was not a good man. The afternoon free in Thomkins Square Park, free to go begging. This was a very difficult thing for many people to do including myself. Bernie made it clear that begging was a very important part of the experience. He didn't say so, but I understood that it was to be a diving off onto the unknown (Zen-folk are often asked, "what do you do after you have climbed to the top of a hundred foot pole? "), a way of letting go of many of the fixed notions we hold about who we are in the world. When we plunge into those waters, we won't know who might come to the surface. I didn't beg, I clung to my cameras. Others did and were well rewarded for their efforts. 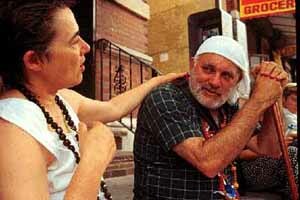 After service, zazen, and talking, we walk to the Bowery Mission to find supper. We are greeted by Brother James who runs the place since he got off drugs 10 years ago and is a friend of Bernie's. Brother James speaks to us for an hour about how the old fashioned way of preaching doesn't work anymore. He felt he had to mirror the diversity of needs that were presented off the street and effectively preach by modeling a life that people would emulate. 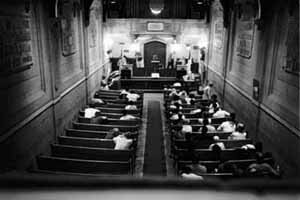 He sang a beautiful gospel tune to us sitting around the formica table and and then ushered us into the Bowery Mission Service Hall where the nightly service was in progress; it was pure fundamentalist fire and brimstone. One homeless client later said to Paco, "These people come every day to preach the gospel to us, the more foolishness they come up with the harder we applaud. This is our nightly show. Most of us who live out here on the street truly understand the message of Christ, we're not stupid, we know what Christ really said." The hall is filled with about 40 people most of whom are enjoying a before-dinner nap. You must arrive at 7 for service in order to receive food at 8. The food is burnt spaghetti with meatballs, canned peaches, yogurt, muffin and cool tea served in a styrofoam cup emblazoned with the logos of Microsoft, Kodak, and Xerox. My table neighbor wouldn't talk to me. 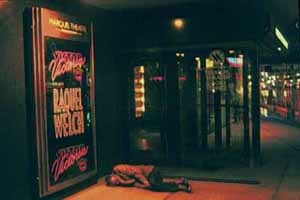 When we leave it is dark on the Bowery, we are to sleep in Penn Station, we walk. Being a native, I lead a small group through Soho, into the Village, past my own house, into Washington Square Park where we look in vain for Angie. Up 5th Avenue and into the railroad station where we lie down on the floor under the central information board. We're indoors on a beautiful night without any rain, so a group of us go outside to look for another sleep. Not easy. I had hoped to bed down on the steps of the main post office on Eighth Avenue (where you can file your tax return up until midnight), but that was clearly well lit and patrolled; we found a scaffolding and Julius climbed up inside, but it didn't feel safe, so we went to the Seventh Avenue entrance and were about to give up, when Paco found an Afro-American gentleman sporting a pipe, black gloves, dark glasses, and a rosary beads without a cross. He seems to know everything about sleeping outside the Garden and Alphonso turns out to be a 'person without address' who prefers to sleep on the subway, but who has taken on the mission of protecting the 'sheep from the wolves': that is, he keeps homeless people from hurting other homeless people here outside the Garden. He tells us that on nights when there isn't an event, the cops allow folks to sleep in the entrance corridors behind the big MSG sign. We are very tired and grateful and proceed to get a good 4 hours of sleep on the hard but clean pavement while Alphonso watches over us. I saw him roust a disheveled man from our midst in the middle of the night; when I asked why he explained that he was concerned about us catching lice from him. Alphonso may have other sides to his personality, but the one we saw this night was that of the angel. 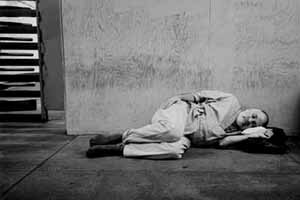 At one point he said, "We homeless are stubborn like mules, we like being out here, we like the liberty". Dawn breaks over the sign advertising the upcoming Arrowsmith concert and we head around the corner to St. Francis for mass and food. Aiming for the end of the line has it's disadvantages: they ran out of food just before me, but others shared and we headed uptown. "Aimless Wandering" was one of our watchwords, but we weren't aimless this morning as we were headed for a knoll in Central Park at 104th Street. I was very surprised that the slow pace of our travel actually got us there and that it didn't seem to take much time. Eve periodically cried out "FREEDOM" at the top of her lungs. We sent two of the walking wounded ahead by subway with begging and bottle money. While waiting for us to arrive on foot, Marzena was approached by a 'film director' who wanted to know if she knew many black people and if she had ever been with a black man. As his questions got more sexual she realized that the open quality we had developed over the past days had its limits. Enkyo returned and he departed with the warning that we should be very careful, there were dangerous people lurking out there. Our time on the streets came to a close. Since being "home" I have run into Angie on the block who was happy to see me, but couldn't talk right then because she had "just been in a fight and had to take care of some things" and I've seen Kevin ride by on his bicycle plugged into earphones with books bulging off his rack; he didn't recognize me.